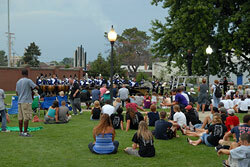 The 2008 Drum Corps International World Championships were officially kicked off yesterday outside Ames Field, site of Tuesday's Open Class World Championship Quarterfinals in Michigan City, Ind. A crowd of participating corps members and eager fans were in attendance to witness the special opening ceremony. Starting the event, the national colors of all represented corps nations were presented — Canada, Japan, the Netherlands, Sweden, and the United States. A ceremonial trumpet, the drum corps equivalent of an Olympic torch, was presented to Mayor Chuck Oberlie of Michigan City. The trumpet will continue on through Indianapolis for the Individual & Ensemble Competition on Wednesday before coming to Bloomington for the three remaining days of the World Championships, culminating for both classes on Saturday, Aug. 9. "We are thrilled that we are starting the DCI World Championships for 2008 in Michigan City," said Dan Acheson, Executive Director and CEO of Drum Corps International, to the assembled crowd. "To have Michigan City's support, to support the Open Class corps in particular, means a great deal to all." A pair of exhibition performances gave fans a taste of what is to come at the Open Class Quarterfinals on Tuesday. Members of Dutch Boy, from Kitchener, Ontario performed their production "Boxed," followed by members of Tennessee-based Memphis Sound performing selections from their program, "Awakenings." "We've had a great group of corps members this year, and they've all worked really hard for how far we've come," said Casey Inlow, assistant conductor for Memphis Sound. "We're all really excited and it's a real honor to be a part of this, the inaugural year of the Open Class. Coming from our first-place finish last year, it's pushed us harder to strive for excellence." "I know I'm looking forward to the competition tomorrow," said Stanley Webster, principal conductor for Memphis Sound, "and I know all the corps members are. They've all worked really hard for this and they all really deserve this. We're up against a lot more corps since they've combined Division II and Division III, but we're not letting that be an excuse. We still have to work hard to achieve what we're trying to achieve." A balloon release capped off the opening ceremonies, and corps members regrouped to head back to their housing sites and get some rest before the long day of competition to come.